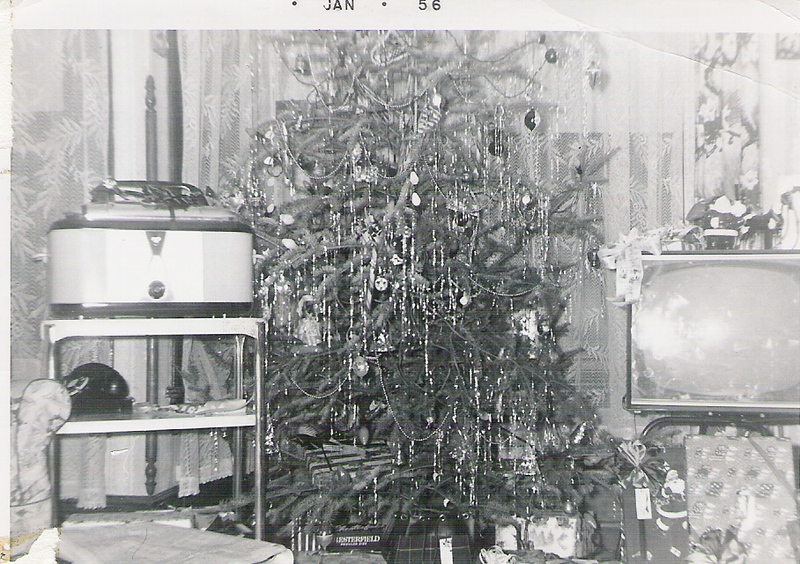 I have an entertainment cabinet in my living room, and each year at Christmas I try and dig out old family Christmas photos and cover the doors of the cabinet with "Christmas Past". I believe it is important to look backwards every once in awhile. It reminds us of who were are, or who we were, or who we are supposed to be, or who we would still like to be. For me it's the memories of a time when life seemed so much simpler, not always better, but certainly simpler. I thought I'd share a few of the photos that will be on our cabinet doors this Christmas season. 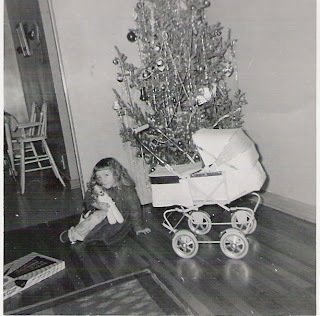 That's me, and that was the year I got my doll carriage from Grandpa Rossnagel- which I still have. The vinyl on the top hood is ripped but otherwise it still looks about the same. Mom had nice shiny floors, did she not? And what's with the 2 highchairs in the kitchen? The Lassie dog is not something I got for Christmas that year as I have a picture of myself at about 1 yr, and Lassie is already present. Here is a favorite picture of mine. This is my son at our apartment. He's two and a half yrs old. We didn't have any place to hang our stockings so we pinned them to the wall. 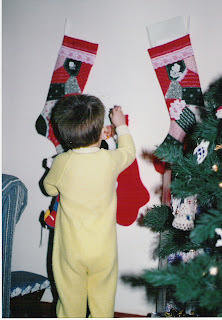 Don't you just love the fuzzy jammies, and the cowlick in the hair. You cant see him, but he is holding a stuffed Mickey Mouse in his left arm, clutched tightly. Mickey went everywhere Jon went, back then. Oh here's a really good one. I'm not sure of the date but I'd say around 1965 or so, give or take a year or two. This is my youngest brother, Dean. For a few years my family would drive to Sandilands Forrest to chop down our own Christmas tree. 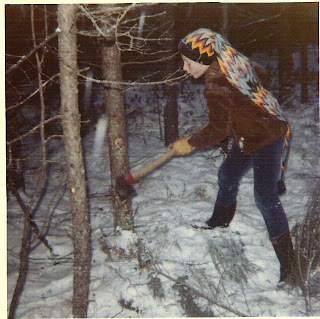 Dean was always a keen wood worker - still is as a matter of fact. Don't you just love that hat? I notice he's wearing rubber boots and not snow boots... wonder why? This picture was copied from a pretty worn original, sorry for the quality. The subjects are adorable however, and it too is one of my favorite pictures. This is my husband Gary and his sister Jane. I love the matching PJ's. Gary looks very much like our son at that age. So cute. Jane I know you read my blog. Hope you don't mind that I shared your photo, hope this memory brings you joy! 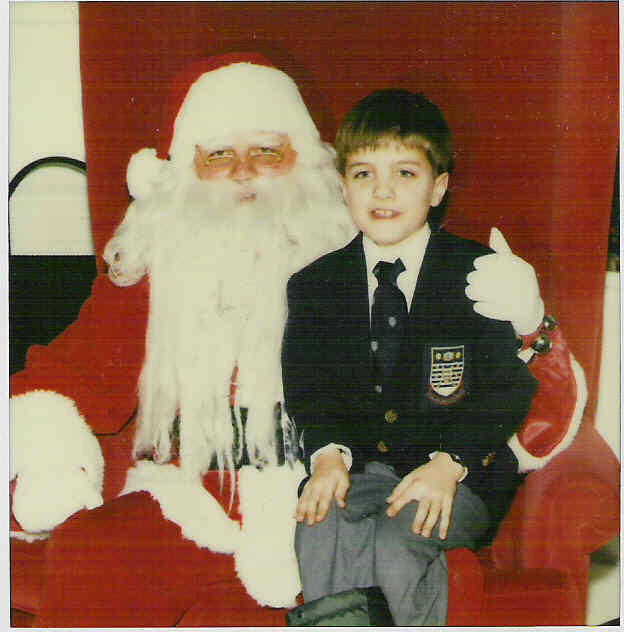 This is the only picture I have of Jon actually sitting on Santa's knee. That would be because it is actually the ONLY time he sat on Santa's knee. Every year when we would go to see Santa and Santa would go to lift him up on his knee, Jon would make a great big fuss, and say "No, I'll just stand here." This year was different because my brother Norman spent Christmas with us this year. After church ( which is why a little 7 yr old is dressed in suit and tie - he was a boy chorister at the time with the Men and Boys choir at St. Georges Anglican Church. They were required to dress in uniform every Sunday). Anyway my brother Norman told Jon if he sat on Santa's knee, he would by him a gameboy. Up he went - and yes - that was the Christmas Jon got is gameboy, thanks to Uncle Norm. I hope you have enjoyed my tour of Christmas Past. There is room for about 30 photos on the cabinet these are just a few that will make their way there this year.